During our recent travels (Sept/ Oct 2012) in China, we had the opportunity to spend several days each in Xian and Beijing. Beijing is well known as the capital of China for many centuries and lately has been at the forefront of international news due to China�s enormous economic and military power. However, the story of Xian is less known but in historic terms it is even more significant. Xian is in the middle of China where as Beijing is to the northeast. In the map below. I have highlighted the two places. Distance between them is approximately 600 miles and the flying time is less than 2 hours. There are few cities in China which has as rich and ancient history as that of Xian. Xian has served as the seat of power for eleven different imperial dynasties for close to 2,000 years � beginning in the 10th century B.C. and continuing until the rise and fall of the Tang dynasty in 9th century AD. This long history included the rulings of the Qin, Han, Wei, Zhou, Sui and the Tang . The Han (206BC- 220AD) and the Tang (618AD � 907AD) periods were considered as the golden ages in all of Chinese history. This city once considered among the world�s greatest cities, slowly faded into obscurity after the fall of the Tang dynasty and the succeeding long wars by the feudal war lords. Then in 1974, accidentally an astounding archeological discovery was made by local farmers as they were digging a well for water for their fruit orchards. As they had to dig fairly deep in search of water, they hit something besides soil and rocks. They hit a few glazed pieces of porcelain and then some more and slowly they found similar pieces on larger areas in the farm. When authorities were informed and checked thoroughly, they suspected ancient burial grounds. Then the archeology department took charge and continued the digging and eventually ended up discovering the most significant archeological finds of the 20th century. This is the Terra Cotta Warriors of Xian, China. Today, this is among the most visited place in China, along with the Great Wall and the Forbidden City in Beijing. The famous museum holds more than 7,000 life-sized soldiers created to guard China�s first emperor in the afterlife. These are astounding pieces, each with an individually sculpted face, standing in military formation in three separate vaults. Each one is different and has different military ranks and roles and carries appropriate armaments. The first emperor, Qin Shi Huang (221BC-206BC) unified the entire China and forged Chinese national identity for the first time. He accomplished tremendously, ruled brutally and his rule lasted less than 20 years. He planned and built his mausoleum and to guard it built the Terra Cotta Army of soldiers and horses. The few pictures below are just a sampling of the magnificence of this museum. His mausoleum itself is still not opened up; the Chinese government wants to make sure that the technology is available to open it safely and securely. In Xian we also visited the impressive nine �mile long city wall and moat. The Shanxi museum in this city is one among the five best museums in China. 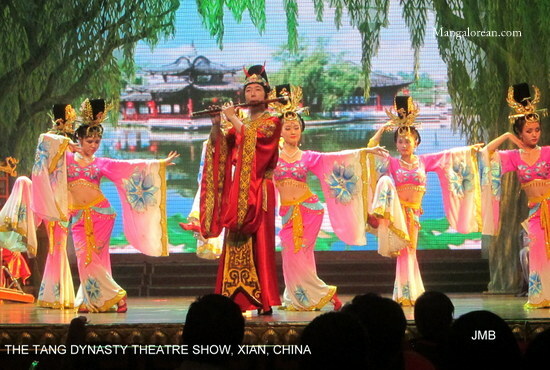 At night, we had an opportunity to see the fantastic Tang Dynasty show extravaganza. Xian has excellent places to dine and we enjoyed traditional Chinese dumplings. I have a few pictures below from the Tang Dynasty show and the old imperial city and from the Shaanxi museum. Beijing has been the capital of China for over 700 years. It was the Mongols led by Kublai Khan, who first established this as their capital. The China ruled by the Mongols was the largest country the world had ever seen. The war like Mongols were unable to effectively keep control and order in such a vast country which was populated by a vast majority of Han Chinese people. They were eventually overthrown in 1367 by the Ming Emperor. Subsequently, The Ming dynasty ruled over China (1367-1644), followed by the Qing dynasty (1644-1911). During all this period Beijing has been the capital and with minor periods the ruling power was shifted to other areas, but essentially Beijing has been the capital of China since the 1300s. China is a mega large country among the nations of the world. It has the most population and the second largest land mass. Central power, policies, directives are all set in Beijing. To know China and its history, people, artistic accomplishments etc, a visit to Beijing is a must. There are very good air connections to Beijing. Beijing airport is modern and is one of the busiest in the world. As a result of the 2008 Olympics in Beijing, China has spent a lot of money to make Beijing a showcase and travel friendly. In the travel circuit, China is considered as an excellent value. Current currency exchange rates are very favorable to the international traveler. What is a good time to go to Beijing? If you have the choice, early spring or the fall months of October and November are better. Beijing weather could be pretty harsh and unpredictable. Due its geographical location, it is subjected to hot, humid summers and very cold dry winters. Summer climate is influenced by the East Asian monsoon. From the north, it is subjected to dust storms from the Gobi deserts. When the combination of industrial and auto pollution and the dust storms hit at the same time, the air quality could be pretty bad. Actually, as I am writing this article (in March 2013), there is an emergency air pollution alert in the Beijing area. In our case (my wife and I), we went to China in late September and early October of 2012. We were lucky that we got excellent weather conditions � just plain lucky. You can see the weather conditions in the quality of the pictures below. 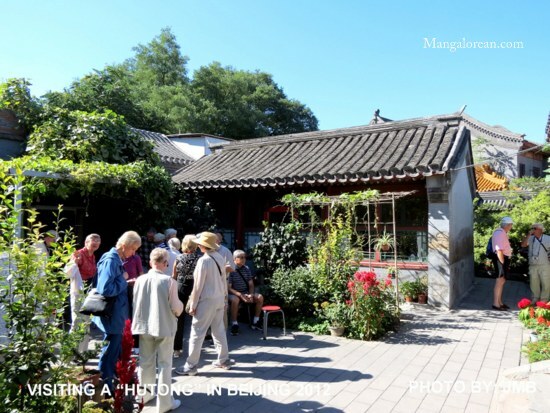 These few pictures are from the Tiananmen square, The Forbidden city, Temple of Heaven, Summer palace and gardens, A Hutong house and the Olympic National Stadium, known as Bird�Nest. Tiananmen Square is one of the largest outdoor plazas in the world that can hold millions of people. At one end of the plaza is the entrance to the Forbidden City with a huge portrait of Chairman Mao. On to the side are large buildings � the great Hall of the People, Hall where Mao�s body lays at rest for public viewing, several museums etc. At the middle of the Plaza is a colossal stone monument for the war dead known as �Monument to Peoples Heroes� � stone weighs over 100 tons. �Forbidden city� has the Imperial palaces (over 800 buildings and more than 8,000rooms), courtyards, gardens and museums. This was the seat of the imperial power during the Ming and the Qing dynasties (1368-1911). The city used to be forbidden to the general population. Now it is open to the Chinese public and for travelers from around the world. It takes many hours to go from the entrance at the Tiananmen square to the last palatial building. Also, there are museums containing imperial treasures to see during the tour of Forbidden city. 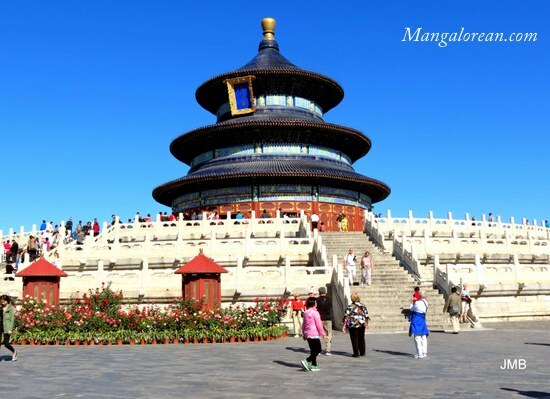 Temple of Heaven is the place where China�s emperors once worshipped. Summer Palace was the former royal retreat with beautiful gardens and temples that is now a park attracting both local residents and visitors. We also visited old neighborhoods that are known as Hutongs. We visited the home of a local family for a rare glimpse of the traditional communal life style that is fast disappearing. Real estate developments in China are going on at a furious place. Beijing is on a mega building boom cycle � both residential and commercial. There are concerns that slow down may come soon. Visiting the Great Wall is among the greatest memories for any world traveler. Its sheer immensity is dazzling. Winding like a never ending serpentine for over 4000 miles, stretching the length of China in the East West direction, it was built as a fortress to prevent the northern nomadic and barbarian invaders. The northern invaders were great horsemen and could strike fast and furious. China was a prosperous nation to the south; the life in the northern deserts was tough and rough and China became a natural target. For some periods of time, even with the Great wall standing, northern invaders succeeded conquering China and became rulers and ruled from Beijing. Construction and improvements and enhancements took thousands of years. First the building materials were mud, straw, then bricks and mortars were used. The place where we visited and the location of my pictures below is known as the Mutianyu section. It is about 55 miles Beijing. Actually the wall comes even closer to Beijing; may about 30 miles. Most of the tourists go the close by places. The place where we visited the wall had fewer visitors as you can see in the pictures. Bus took us to the base of the mountain. From there it is a hike of about 1/2 a mile steep hill. Then you take a ski lift to the base of the wall. Then you climb a few steps and you are on the wall. At this point, public is allowed to go for about a mile and half. On a clear day, such as the one we fortunately got, the views are fantastic. Wall going forever over the mountains, mountains cascading from one to another, farming valleys deep below. Even in these few pictures, you get a good feeling for the type of construction and the fortification methods etc. The great Wall is the icon of this once and now great nation. While traveling in China, if you want to remember couple of Chinese words, they are Xie Xie (means Thanks) and Nihao (means Hi, Hello). Nihao ma..means how are you? While in China, please try it - you will be pleasantly rewarded with a surprised smile. J.M.Bhandary is a travel writer. He is from Mangalore area and has been a resident of USA for many years. He studied at St. Aloysius College, Mangalore, BVB Engineering College, Hubli and Stanford University, California. His wife Hilkka Bhandary is from Finland. Mr. Bhandary has been a travelogue contributor to Mangalorean.com for the past many years. Besides travel, his other interests are Nature photography, History of Coastal Karnataka, Western Ghats, Endangered world cultures and languages and many others. Thanks for your kind comments on this article and pictures of China. I appreciate it. Thanks Jay for allowing us to feel as though we were with you and Hilkka on this trip. The photos are great and your writing descriptive and historically informative. If we ever get to China, I will use your travelogue as a guide. This is a fabulous recap and reminder of our great trip. I'll share with my children and grands! Would you like to go to Malta next??? Great article Jay. thank You for sharing this. Good pictures. I need lessons from you...do not know how to put it together! Excellent! Made the trip to China come alive again. You could lead the next tour with Ping! Thanks for sending the link. Thank you for your comments on this travelogue. I am glad that you all liked the article and the pictures from Xian and Beijing. For the ones who are seriously considering travels in mainland china, I would strongly suggest taking guided tours from reputable tour companies. If you travel on your own in China, language could be a major issue. A vast majority of the people only interact in Chinese language. If you take a taxi or go anywhere on your own, please have the hotel front office write clearly in Chinese your location to return and the places you want to go. Have the Hotel card with you, written in Chinese on the back. Talking with hands and gestures won�t do any good. Be aware of the Chinese National holidays�transportation and special places could get very crowded. It is somewhat like Diwali festival time in India. A good tour operator should be able to help with these issues. China is an exciting travel destination. The government is actively promoting tourism and the political status is fairly calm and stable, currency is favorable and so, I think this is a good time for traveling. Great article - - - and fantastic pictures! Thanks for sharing Jay. VERY NICE AND INFORMATIVE ARTICLE. THANKS FOR SUCH A NICE INFORMATION. Very nice, Jay. Thanks for forwarding the link to the article. I enjoyed it very much and will forward the information to my daughters. Great article and beautiful pictures Jay. Beautiful article and pictures! You and your wife were lucky to have such great weather! Happy travels! Nice article and nice pictures. Wishing to see pictures of more Asian/African and South American countries in the future.